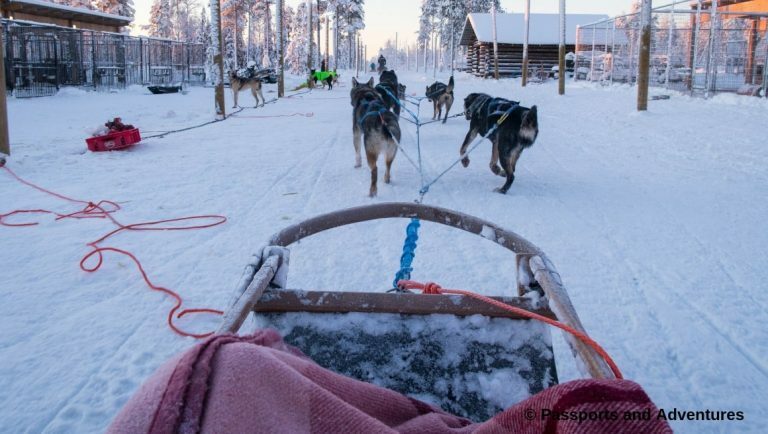 When we were organising our trip to Finland and thinking about what we wanted to do while we were in Finnish Lapland, a husky experience of some sort was high on our priority list. But we had no idea where to start looking. Thankfully Visit Rovaniemi came to our rescue and suggested we check out Bearhill Husky. 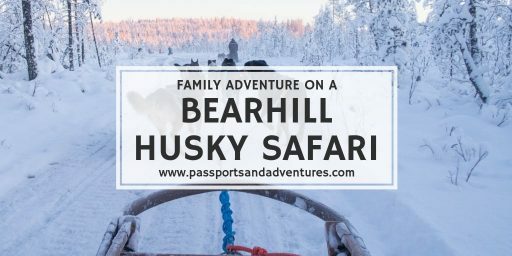 In this post you’ll find out how we had an awesome family adventure on a Bearhill Husky Safari. And it wasn’t without its surprises! 1 Who are Bearhill Husky? 3.1 What husky safaris do they offer? 3.2 What type of huskies are at Bearhill Husky? 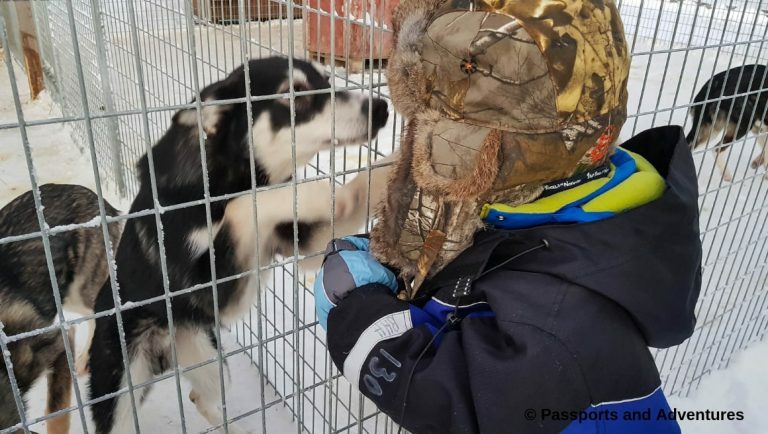 Bearhill Husky are a family operated husky kennel just outside of Rovaniemi, Lapland. Established in 2003, they first concentrated on longer tours from their base in Lieska in North Carelia. 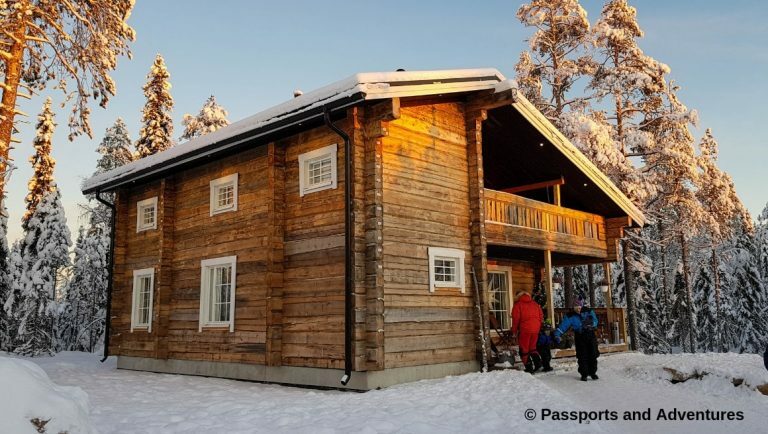 When their family grew and demand for their services grew, they decided to relocate to Rovaniemi in 2012 to focus on day trips and shorter tours. They are passionate about their dogs, train them and let them be the best dogs they can be. And if you follow them on Instagram and watch their stories, that passion comes through when listening to their reports. We decided to book ourselves onto the Happy Trail Morning Husky Safari as it is suited for families with younger children. There is always a worry when thinking about winter excursions, whether they will be suitable for our son. Although we would have loved to do an Aurora hunting excursion (northern lights hunt), we knew from experience that he was too young. Mr Passports and I have done no less than 3 northern lights hunts in the past and the last one, during which we saw and photographed the Aurora Borealis in Norway, we were out until 2am and it was a long night. So, common sense prevailed, and we didn’t do one. But when I discovered that the Happy Trail Husky Safari with Bearhill Husky is suitable for families, I knew I was going to book it. Booking was very simple. I contacted them initially to check the safari was suitable for a 4, almost, 5-year old and once they assured me it was, they sent me instructions to make my booking online. With my payment done, we were booked for a family adventure with them. And we couldn’t wait. This was one experience we didn’t do as a couple when we visited Tromso due to the late nights hunting for the lights. So, my husband was more than happy when I told him what I’d booked for us. On the morning of our safari, we were picked up in central Rovaniemi, just a short 15-minute walk from our AirBnB. Transport to and from Bearhill is included in the price of your safari and there are a few pick-up points around Rovaniemi. Once everyone was on board we headed out of the city and into the beautiful landscape that surrounds Rovaniemi. Everything was covered in white and it was simply beautiful. If you’d like to see some of the landscape and the kennels, then check out Part 2 of Lapland in my Instagram highlights. When we arrived at Bearhill Husky, we were greeted by our guide, Istvan, and the noise of barking dogs. We were led into a large log cabin and given arctic over-suits, boots, gloves and neck warmers. And believe me, you need the over-suits. Despite everyone being kitted out in snow gear, we all put the suits on over our clothes and were thankful for them later. Once everyone was kitted out, we were taken outside for our safety briefing. The Bearhill Husky Guests Lodge. Istvan would lead the way but we would be mushing our own team of dogs. Panic set in as I realised I’d be doing the driving. Mr Passports had injured his back the day before we flew to Finland so there was no way he was going to be driving. There is a stop halfway around so that you have the opportunity to switch and let someone else drive the sled. However, for us, that wasn’t an option. To say I was s**ting myself would be an understatement. Istvan explained how the brakes worked to slow the dogs down. 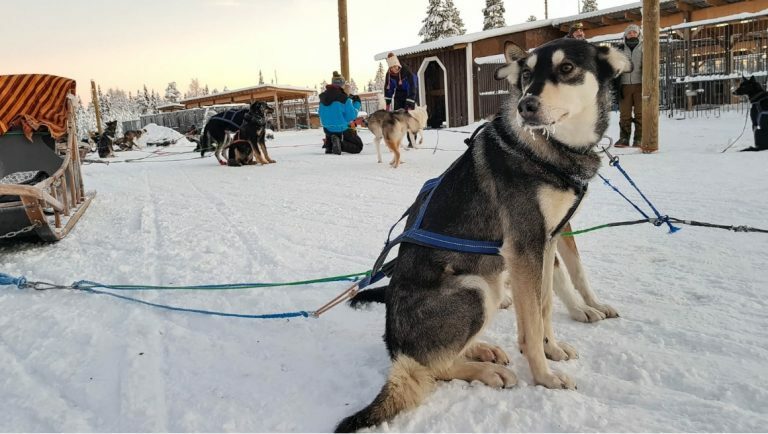 He explained that we should never let the leads get too slack or the dogs can become entangled, and to never let your dogs go ahead of the sled in front of you, again to ensure no dogs become entangled. And with that, we were paired up with our team of huskies and ready for the off. Istvan going through our safety talk. We were probably about the fifth or sixth team and Mr Passports and our son were safely (and warmly) tucked up in the sled under blankets, while I was on the back. Once the dogs were let loose they quickly picked up speed and we were off. Just a few hundred meters from the start line, as we entered the forest trail, we were in for a big surprise. There was a massive boulder in the middle of the trail, which the dogs just ran around. However, the sled had nowhere to go and we hit it full force, which knocked me off the foot rails. My feet slipped off and I ended up dragging behind the sled like a scarf that’s caught the wind. The one thing Istvan told us during our safety talk was not to let go of the sled because the dogs will just keep going. This was running through my mind as I desperately tried to keep hold of the sled, all the while trying to get my feet back under my body, so I could get back onto the foot rails. My hubby had no idea I’d slipped off until he heard me screaming “I can’t hold on anymore”. There was nothing he could do to help as he was sat in the sled with our son in front of him. All I could think was “don’t let go, don’t let go” because if I did, the boys were on their own. But I just couldn’t get my knees under my body and my feet on the ground to get myself up, the dogs were just going too fast. I knew I had to get up somehow as I was getting to the point of not being able to keep holding on. So, holding on for dear life with my left hand, I took my right hand off the sled and used it to slam the brakes down as hard as I could. I lost my glove in the process, but I got that sled stopped for long enough to get my feet onto the rails before we set off again. It was the scariest few minutes of my life, and the most helpless I’ve felt for a long time. But I got up and, with the help of Mr Passports, I got one of the Bearhill gloves onto my right hand. And from there on it was a fun adventure. I didn’t slip off again and started to enjoy it once the fear and terror had subsided. We followed a path through the wintry forest, with gentle twists and turns, nothing too bad. We got the hang of telling the dogs to “woah” as I applied the brakes to either slow them down or stop the sled and they seemed to be listening. We made sure not to let the lines go slack and also made sure we slowed down with plenty of time if the teams in front of us stopped. I had to really stand on that brake at times as the dogs just wanted to keep going. You could see the pure enjoyment in their faces once they were off. Sledding through the snowy Lapland forests. We left the forest for more open ground at which point we stopped, the halfway point, for some photos and to allow people to switch places. As I mentioned, I kept driving because Mr Passports wasn’t up to it. I would have liked to experience the safari from within the sled, but it was not to be this time. We then set off again, following another trail through the snowy forest until we arrived back at the kennel area. I was so glad to get there and in fairness, the 30 to 40-minute ride had flown past quite quickly after my fall. Once back at the kennels we entered a yurt to enjoy warm berry juice and cookies and it was lovely stepping into the warmth of the yurt. You think you’re dressed for the weather and then you realise how much you need the extra protection of the arctic suits Bearhill provide. Going at the speed of 4 or 5 dogs really drops the temperature and the chill of the air flying past you is more than just biting. And those gloves, once I lost mine, I was so glad they had given us extras as my hand would have been completely frozen without it. While we were in the yurt, Istvan shared stories of his own. He competes in professional dog sledding races and had a team of his own dogs at Bearhill while we were there. He told us about taking part in the Finnmarksløpet race, a 1000km race which starts in Alta, Norway. It was fascinating to hear about how they race, sleeping in shifts, taking more than an hour to feed, water and tend to the dogs. There is no support for them, each team must take what they need with them. They can only call on support to switch dogs out or for extra food but otherwise they are completely on their own for 1000km. That’s some race. After we had warmed up and listened to Istvan’s stories, we headed outside to meet the dogs and say hello to some of the pups in the kennels. They are just beautiful dogs, so well looked after and clearly happy. Thy want nothing more than to get running and if they think they’re going to be set loose, the noise become deafening. Our son was thrilled to say hello to the younger husky dogs of Bearhill Husky kennels. It was soon time to say goodbye to the dogs, return our suits and get on the bus for our journey back into Rovaniemi. It was an incredible experience, one we won’t be forgetting in a hurry for a number of reasons. And despite my fall, and the aches and pains for a week after as a result, I would do it again, only this time I’d strap one of my feet to that foot rail! The safari is well run and coordinated. The dogs are so enthusiastic, and most are very friendly, well up for a cuddle after their run. The dogs are well looked after and have huge kennels. Many are inter-connecting, so they can socialise. If a dog appears to be tiring, they will swap them out at the end of the run so as to rest them. The tracks through the forest and open ground follow some stunning landscapes and offer some quiet as well. Everything is so still and silent in the forest, apart from the sound of the dogs. There are plenty of arctic suits, gloves and boots available in the changing hut for everyone taking part in the safari. And believe me, you need those suits. The guide and support staff happily take pictures for you at the half-way point. The warm berry juice and cookies in the yurt are a welcome relief from the cold outside after our safari. 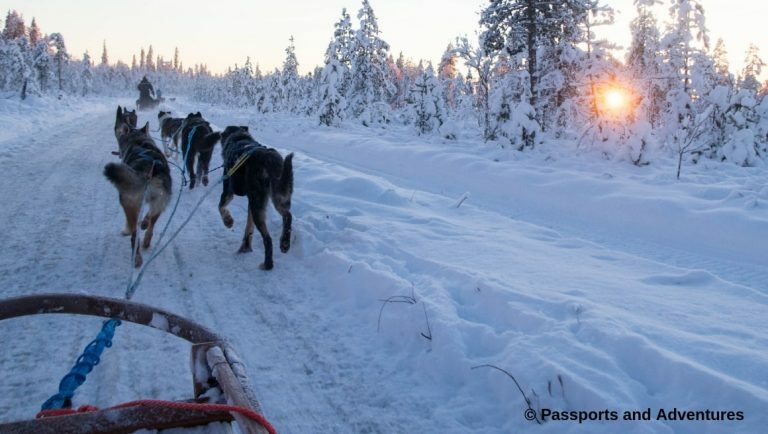 The transport offered is brilliant with several pick-up points throughout central Rovaniemi. The cost of the safari was well worth it in my opinion, and I would do it again in a heartbeat. The only thing we feel could be improved for the experience is advice on what to do if you fall off the back of the sled. When we hit that boulder and I fell off, I really had no idea how to get back on and the only thought flying through my mind was “don’t let go”. The person in the sled can’t do much for you, especially if they have a child in there with them. 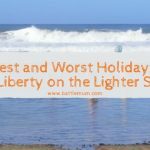 So, some advice on what to do if this happens would be beneficial for future visitors. One of the beautiful husky dogs. We really enjoyed our safari with Bearhill Husky, and despite the fall, it was an experience to remember. The landscape you go through is stunning and the whole operation is well run. Our guide was welcoming and happy to share his stories with us in the yurt which were fascinating to listen to. The safari experience flew by and the 2-3 hours felt like half an hour. It’s enough time I feel for an experience of this kind, especially for families. The dogs are all well cared for and you can tell they are happy by their playfulness, enthusiasm and eagerness to get going. If a dog tires during a run and were scheduled to go on the next safari, they will be swapped out with another to rest. This actually happened to a few younger dogs after we returned from our morning trail. It is nothing like a husky ‘farm’, each dog belongs to someone working there and many take part in competitive races. 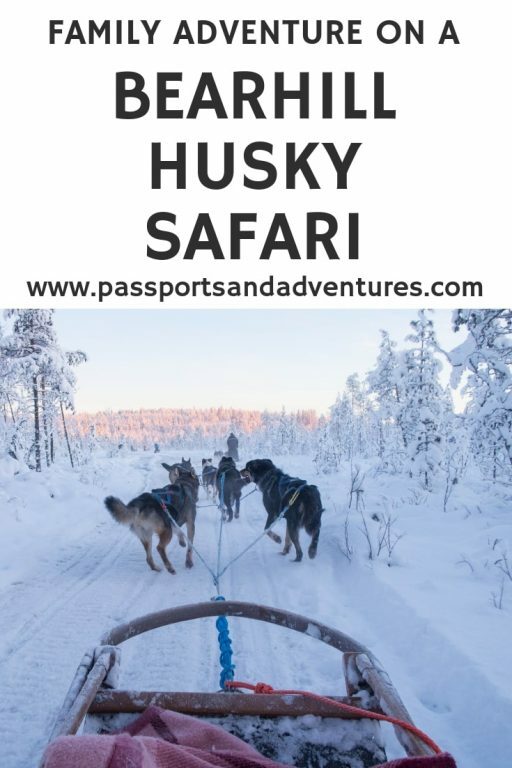 We are so glad we did our husky tour with Bearhill Husky and highly recommend them for your own husky safari if you are visiting Lapland. We are also grateful to Visit Rovaniemi for suggesting them to us. What husky safaris do they offer? Bear hill Husky offer several husky dog sledding experiences to suit everyone. They have six winter experiences and they had four summer/autumn experiences in 2018. During winter, experiences including the Happy Trail Morning Husky Safari, which we took, and a Happy Trail Afternoon Safari, both of which last between 3- and 3.5-hours including transfers. These are suitable for families with children from 4 years of age. There is a longer 4.5-hour safari called the Call of the Wild Morning/Afternoon Husky Safari which is also suitable for families with children from 4 years of age. This has a 1.5-hour husky safari whereas the Happy Trail is a 30-40 minutes safari. There are also two longer safaris which are adults only. A full day safari and an overnight safari. Full details of the winter and summer safaris are available on the Bear hill website. Please check the details of individual safari’s for age limits, duration and prices. What type of huskies are at Bearhill Husky? Bearhill Husky operate with Alaskan Huskies. They range in size, shape and eye-colour than more traditionally known Siberian Huskies. They are well-known within the dog sledding world, but relatively unknown outside of it. Some will have blues eyes but do not be disappointed if none of the dogs on your team have them. They are working dogs and are trained throughout their working lives. There are generally 8 teams of dog in the Bearhill Husky safaris. There can be two adults and up to two children per sled. One adult must always drive the sled, with the other sitting in the sled with the children. You can switch at the half-way point if you want to. There are blankets in each sled to cover up. You’ll need them. And make sure to use the Arctic outer clothing provided by Bearhill Husky. You do also need to ensure you are suitably dressed in appropriate winter clothing. 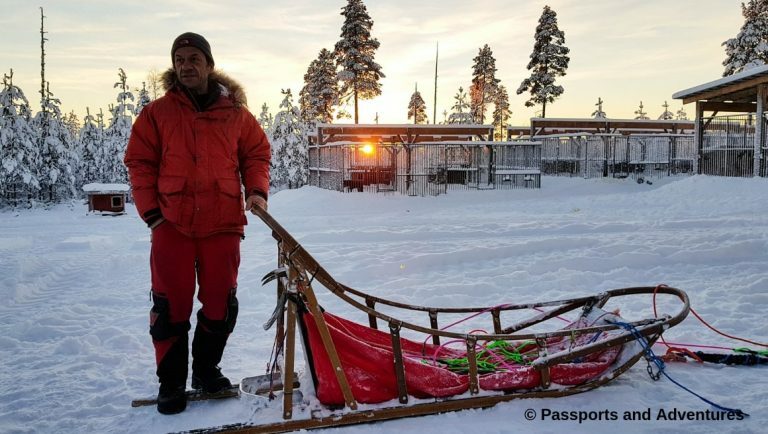 You can find more information about what to pack for Lapland with kids in my post I’ve written. You most likely will not come across husky puppies during your visit to Bearhill Husky. They do not breed dogs for the sole purpose of showing puppies. If this is what you are after, then Bearhill Husky themselves will tell you to go elsewhere. They breed their dogs for Springtime, so they have the maximum amount of time to socialise their dogs and train them. 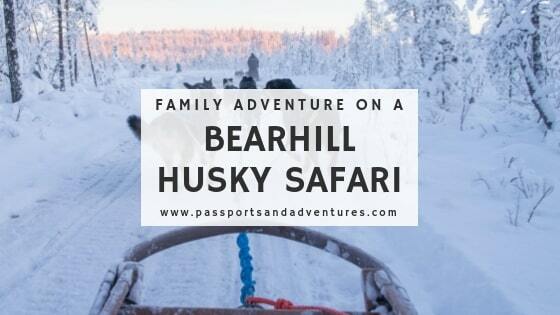 I do hope you’ll check out Bearhill Husky and book a safari with them if you are heading to Lapland and want a truly awesome dog sledding experience to tick off your Lapland bucket list. Just don’t fall off like I did! *We received a discount of a free child place for our Happy Trail Morning Safari from Bearhill Husky and paid for 2 adult places. 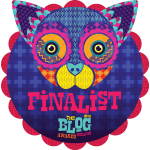 They did not ask us to write this review and all opinions expressed within this post are our own, honest thoughts of the experience. Oh wow this would literally be a dream come true for me it’s something I’ve always wanted to do – it looks so magical and exhilarating!! Wow! What an amazing experience. I would have loved to do this when I was a kid! thank you for the really detailed write up – this sounds epic – what a massive adventure if rather scary nearly falling off (glad you managed to stay on). My husband would love to do this 🙂 it’s way too cold for me though. It’s going to be amazing! Can’t wait to read all about it. Oh this is amazing, what an experience even though you did fall off. You survived the experience and then got to enjoy it too. Well done you on being so brave! This looks amazing! A friend of ours went to Greenland and did this and I was so jealous. I can imagine parts could be pretty scary. This looks great. I would love to experience this. What an amazing experience. I am glad the dogs enjoyed it as well and seemed well looked after. I think you were very brave to carry on after your fall. Oh my goodness! Who wouldn’t be thrilled to be in this haven? Bearhill Husky Safari is now on my bucket list. This sounds like an absolutely amazing experience! I would love this and do would my other half, who is husky mad!